Acknowledged author wrote FEDERAL INCOME TAXATION 7 comprising 1465 pages back in 2016. Textbook and etextbook are published under ISBN 1609302648 and 9781609302641. 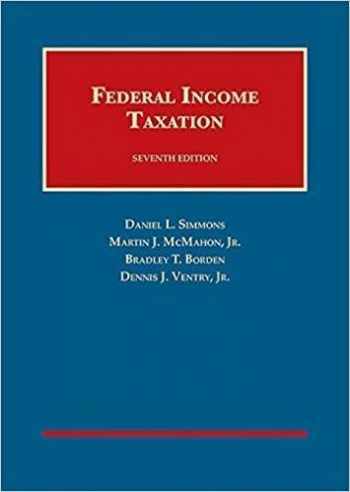 Since then FEDERAL INCOME TAXATION 7 textbook was available to sell back to BooksRun online for the top buyback price of $37.94 or rent at the marketplace. This casebook explores both the technical and policy issues associated with general principles of income taxation. The book is unrivaled in scope, depth of analysis, and flexibility. The materials facilitate focusing on either in depth coverage or broad policy issues for any particular topic. Within units, the material moves from the straight-forward to more complex rules, thus enabling each professor to make a decision as to the level of complexity which he or she wishes to reach in the course. The text can be used in a single course covering basic income taxation or a sequence of courses dealing with income taxation at either the J.D. or LL.M. level.